Cocoa solids (Cocoa mass & Cocoa butter), Sugar, Emulsifier (Soy Lecithin), Vanilla Flavour. 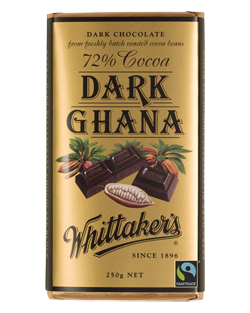 Dark Cholocate contains cocoa solids 72%. Very very good. I've become very much a snob with chocolate. This is one of the best 72% bars I've ever had- I've had over 5 kilo and still not bored. Very eatable, excellent balance. Some fancy single estates are very strong, great but you can't eat too much. This is perfect for everyday. I cycled around New Zealand for a year. It was hell, I'm not sporty! But it turned out to be the best experience of my life. I could never have got through without the rich, dark (but not bitter), mouth-filling, heavenly dark Ghana. Those days when I was soaked to the skin in my leaky tent, Ghana kept me going. When I made a cheeky chocolate custard to keep the cold out in minus 5, yep, it was dark Ghana that added the magic ingredient. Now that I'm home in Scotland I spend a small fortune having it sent over - it's currently getting me through a difficult pregnancy. If it can do that, it can do anything! !